VOL. 30, NO. 4 & 5 TAMPA, FLORIDA SEPTEMBER 8 OCTOBER 5, 2017 20 PAGES By BOB FRYER Jewish PressWhile many fretted in darkness as Hurricane Irma battered the region, some weathered the storm in style, staying in facilities where the lights, television and internet never went out, hot showers and three hot meals a day were offered and day care for kids was a reality. That is how it was for those who stayed at Jewish centers for the elderly in Tampa Bay. I heard a quote somewhere that The worst natural disaster can bring out the best in human nature and I think that was true for us, said Rob Goldstein, CEO of Menorah Manor, the St. Petersburg institution that serves a number of frail and elderly Jewish residents at the Toby Weinman Assisted Living Residence and the Marion and Bernard L. Samson Nursing Center There and at Weinberg Village, an assisted living facility on the Maureen and Douglas Cohn Jewish Community Campus in Citrus Park, northwest of Tampa, some of the most vulnerable members of the Jewish community were in good hands. At both institutions the PRESORTED STANDARD U.S. POSTAGE PAIDThe Jewish Press Group of Tampa Bay, Inc.The Jewish Press Group of Tampa Bay, Inc. Jewish Press of Pinellas County P. O. Box 6970 Clearwater, FL 33758-6970 IRMA continued on PAGE 18 ELDERLY continued on PAGE 19 LSHANAH TOVAH! Combined High Holidays and hurricane editionLetter from the EditorsIts all about power the power of Mother Nature and the type of power you get out of an electrical plug. Like many of you, the Jewish Press and as of Friday, Sept. 15, the electricity still had not been restored. Combine that with our printer and mailer shutting down a couple of days before the hurricane to protect their sensitive equipment and it was a perfect storm for us. As a consequence, we decided to combine Right now, we are producing the paper out of our small condominium. That has presented its own challenges, but we are persevering. One of our main goals has been to docuJewish community fared in the hurricane. There are some heart-warming stories of how various institutions reached out during and in the aftermath of Irma. Thank you in advance for your understanding. Some of the usual synagogue and organizational news may not make it in the paper due to space restraints and our effort to get the paper to the printer as soon as possible. Some other information may be outdated by the time you will receive this combined edition prior to there are no guarantees. Karen and Jim Dawkins Jewish Press co-owners Elderly pass night peacefully as Hurricane Irma rages Rabbi Leah Herz, left, and Janice LeVine, at the piano, lead Menorah Manor staff and their family meters in song during the Hurricane Irma.Irma slams cemetery but spares most other local Jewish facilitiesBy BOB FRYER Jewish PressHigh winds from Hurricane Irma toppled 8 huge trees and 20 medium sized ones at Chapel Hill Cemetery in Largo, uprooting one casket and causing up to $75,000 damage. Though the casket, entangled in roots of a large tree, was not in the Jewish portion of the cemetery, the fallen trees damaged the main irrigation pump and pulled irrigation and drainage lines from the ground, leaving the cemetery, owned by the Jewish Burial Society of Pinellas County, with estimates of $50,000 to $75,000 to make all repairs and do landscaping work to restore the grounds to normal. It is apparently the hardest hit Jewish facility in the Tampa Bay area. Only relatively minor damage was reported to other local Jewish community institutions, as of the press deadline. On Friday, Sept. 15, four days after Irma struck the Bay area, Doug Negretti, chairman of the Jewish Burial Society, was at Chapel Hill waiting on a crane to remove the casket from the roots and rebury it. All of the caskets [in the Jewish portion of the cemetery] are secure and people should not worry about their loved ones, Negretti said. There was no damage to headstones and only two small trees blew down in the Jewish Menorah Gardens. Those toppled trees did not affect burial sites. As utility trucks were arriving and giving Negretti hope the facility would have power before the day was out, he noted that the cemetery is still capable of holding funerals. The Jewish Federation of Pinellas and Pasco Counties board is to meet on Monday, Sept. 18, to discuss the cemeterys funding needs. The rest of the Tampa Bay Jewish community heaved a collective sigh of relief after Hurricane Irma swept through the region in the early morning hours of Monday, Sept. 11 and left many grateful that a change in the projected path spared the region of catastrophic disaster. Instead of talk about buildings destroyed and lives lost, the main concerns for most were when electrical power, cable and internet service would be restored and when some of the few postponed events would be held. With power still not restored to all areas by Friday, Sept. 15, a few synagogues had not been reached as of press time. Rabbi Daniel Treiser of Temple Bnai Israel carries two Torahs out of the temple for safe-keeping at a secure place during the storm. 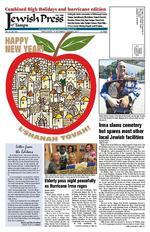 www.jewishpresstampa.com HAPPY NEW Y EAR! JEWISH PRESS of TAMPA PAGE 3 SEPTEMBER 8 OCTOBER 5, 2017 Your 24/7 Source For:Jewish Community News National & International News Advertising Information www.JewishPressTampa.com RALPH BOBOArea/Branch ManagerNMLS ID 432371 State Lic. L025098 3903 Northdale Boulevard, Tampa, FL 33624C: 813.781.1024 Ralph.bobo@caliberhomeloans.com www.RalphBobo.com Right at Home offers caregiving services for almost any family and practically any situation. from the Menorah Manor family from the L'Shana Tovah! WWW.360R EALTYT AMPA.COM813.508.2715 360 REALTY CARLYN NEUMAN PAGE 12 JEWISH PRESS of PINELLAS COUNTY In 8-minute call, Trump says New Year offers chance for Israeli peace, vows to keep Jews safe from hate resident Donald Trump speaking to Jewish leaders in a conference call at the White House as staffers look on. By RON KAMPEAS JTA news serviceWASHINGTON The debate has gone on for weeks among rabbis and Jewish leaders: If President Donald Trump does not formally renounce white supremacists, is it still worth engaging in a conversation with him? This was on much of the Jewish communitys mind since Aug. 23, when the leaders of three religious streams Reconstructionist, Reform and Conservative said they would not organize the annual pre-Rosh Hashanah call with the president, which the rabbinical groups had instituted at the start of the Obama administration. That call, principally for clergy, was aimed at helping to shape High Holidays. Instead, the White House decided to hold a call with Jewish leaders one that would be in line with the calls and meetings that Jewish leaders have had with the sitting president since the Eisenhower era. It would be initiated by the White House, and both lay and religious leaders would be invited. On Friday, Sept. 15, Trump delivered his holiday greetings in a conference call that barely lasted eight minutes. He took no questions. By contrast, calls and meetings with past presidents have included exchanges sometimes tough and generally lasted at least 45 minutes. Some of the participants expressed disappointment after having done public battle with the Reform, Reconstructionist and Conservative movements over whether one should engage Trump in conversation. Everyone would look less stupid if he had just put it on YouTube, one said, encapsulating the one-way direction of the conversation. Not invited to join the call were the Reform and Reconstructionist movements. The Conservative movement did receive an invitation but Rabbi Julie Schonfeld, the CEO of its Rabbinical Assembly, declined to participate. All the participants who spoke because the call was off the record, although the White House released a transcript that afternoon. Rabbi Avi Shafran, the director of public affairs for Agudath Israel, a haredi Orthodox group, had argued in a Forward op-ed Thursday, Sept. 14, that the rabbis who had opted out of the call with the president were missing an opportunity to raise the painful issue of the white supremacists and neo-Nazis who marched in Charlottesville, which culminated in an attack by an alleged white supremacist that killed one counterprotester and wounded at least 20 others. There is a difference between respectfully asking a president to clarify that he does not equate proponents of white supremacism with protesters against the same and, however one might feel about him, publicly and starkly insulting our nations duly elected national leader, he said. In the end, there were no surprises. Trump covered the standard range of issues in these calls and did not depart from the script. Anti-Semitism and bias: We forcefully condemn those who seek to incite anti-Semitism, or to spread any form of slander and hate and I will ensure we protect Jewish communities, and all communities, that face threats to their safety, he said. Israel: The United States will always support Israel not only because of the vital security partnership between our two nations, but because of the shared values between our two peoples, he said. Trump noted that his ambassador to the United Nations, Nikki Haley, was making a priority of keeping international bodies from singling out Israel for criticism. I can tell you on a personal basis, and I just left Israel recently, I love Israel, he said. Peace: This next New Year also offers a new opportunity to seek peace between the Israelis and Palestinians, and I am very hopeful ress before the end of the year, the president said. Ambassador David Friedman, Jared [Kushner], Jason [Greenblatt], and the rest of my team are working very hard to achieve a peace agreement. I think its something that actually could happen. Friedman is the ambassador to Israel, Kushner is his son-in-law and a top adviser, and Greenblatt is his top international negotiator. Kushner, an observant Jew, opened the call by introducing the president, saying his father-in-law takes great pride in having a Jewish daughter and Jewish grandchildren. Ivanka Trump, Jareds wife, is also a top adviser to her father. The controversy surrounding the call began last month, when the Reform, Reconstructionist and Conservative movements cast their decision to cancel the call an outcome of Trumps equivocation after the Charlottesville violence, when he said many sides were to blame for the violence, and among both the white supremacists and the counterprotesters. The presidents words have given succor to those who advocate anti-Semitism, racism, and xenophobia, the statement said. On Thursday, Sept. 14, Trump again insisted that there was blame on both sides. Those who participated in the call said that even absent a question-and-answer period, it was still better to be on the call than not. These are rabbis whose foremost cause should be the Jewish people and Israel, said Morton Klein, the president of the Zionist Organization of America. Klein, who was on the call, noted that he participated in similar calls and meetings with Obama, even though he rarely agreed with him.Why stupidly insult the president, who we need for those issues? he asked. Rabbi Jonah Dov Pesner, director of the Religious Action Center of Reform Judaism, said in an email to JTA that because he was not on the call, he had no comment on what was said. But, he wrote, We stand by our decision to not host a High Holy Days call with the President this year. We are disappointed that the President continues to draw a false equivalency between white supremacists and counter-demonstrators in Charlottesville. At 2 a.m. Monday as the storm was hitting hard, Goldstein was walking the halls with Major, the 1-year-old son of a staffer, in his arms, trying to keep the wiggly child from waking others. Later, Major sat on a sleeping bag in steins dog both baby and dog content. At Weinberg Village, people watched the movie Mama Mia during the storm. Across the bay at Menorah Manor, Janice LeVine, wife of Menorah Manors medical director Dr. David LeVine, played the piano, just to take her mind off things. Soon she was surrounded by children and they had a sing-along as the kids requested Bruno Mars tunes. Rabbi Leah Herz, Menorah Manors staff rabbi, joined in. When an elderly woman devel oped a tooth problem, Dr. LeVine determined it needed to be pulled something he had never done before. He consulted with colleagues on the outside and found what he needed for the job and pulled her tooth, using topical anesthetic. She did beautifully, said Judy Ludin, chief development for Menorah Manor. At the facilities on both sides of the Bay, the routine of regular activities was maintained for the residents and kosher meals were offered three times a day. Wi-Fi was available for all to keep other relatives and friends up to date on how they were weathering the hur ricane. Goldstein at Menorah Manor and Sultan at Weinberg Village cellent job of caring for the residents at their facilities and making the residents feel safe and secure. After the storm passed, some Menorah Manor staff members found their homes had no power and were allowed to stay on, with their families. At Weinberg Village, one staffer who was not immediately allowed back into her Because schools were closed for the entire week in Pinellas County, daycare service for Menorah Manor staff family members was offered through the end of the week. JEWISH PRESS of TAMPA PAGE 19 SEPTEMBER 8 OCTOBER 5, 2017 Inscribe us in the Book of LifeNew Year. New Optimism.Create Your Legacy.This is the time of the year when we pause to reflect and consider. We think about the past and the future. We make amends and we make plans.Your legacy can be structured to fit your lifestyle, goals, family, and financial needs.TOP Jewish Foundation is here to help you with tax-advantaged planned-giving strategies and to provide professional investment management for legacy funds. Whether youre able to establish large funds or small ones, we invite you to call and discuss the possibilities. Tampa Orlando Pinellas Jewish Foundation, Inc. 13009 Community Campus Drive, Tampa, Florida 33625 ELDERLYmanagement teams followed news of the storm and began preparations days in advance of it hitting here stocking up on food, medications, water, snacks, nursing and emergency supplies and fuel for back-up generators. The storm left those in Menorah Manor facilities and at Weinberg Village virtually unscathed. When the power went out in St. Petersburg a back-up generator switched on seamlessly, and at Weinberg Village, the facility never even had to use its generator. Staff and families came in to stay during the hurricane and we were so prepared that the event was uneventful. Of course, you have to consider how fortunate it was that it did not hit us as a Category 5 but more as a .5, said Dan berg Village. At both Menorah Manor facili ties and at Weinberg Village, staff workers were invited to bring their families and pets and stay for the duration of the storm a move that not only ensured an abundance of staff help but had the added bonus of staff family members pitching in to help in a variety of ways. It was an unbelievable sight to watch the families arrive on Saturday. We had people greet them at the front door to welcome them like they were coming to s 5-star hotel, Goldstein said, noting that during the storm the Menorah Manor facilities housed about 180 residents, 100 staff members and 200 family members. At Weinberg Village there are about 80 elderly residents and they were joined throughout the storm by about 25 staff members and 25 staff family members, including one child only 6 months old and the 65-year-old mother of a staff member. truck with battery operated fans, kets, towels, clothing and diapers. Hillels of the Suncoast students and others who have volunteered will sort out the donated items so they can be sent where most needed. Alissa Fischel, director of development at the Tampa JCCs and Federation, said that Jacksonville the Federation is waiting to hear from Federations that cover the hard hit areas in the Florida Keys, Naples and Miami to assess their send and where to send them. The Pinellas/Pasco Federation issued a call for people to go to a local blood bank to donate blood. Before Irma hit, both local federations set up a web portal for their communities in the event of an emergency. A nationwide initia tive, the web portal allows organizations and communities to set up individualized sites where community members and leadership can communicate with each other. Folks can indicate if they are safe or need help, if they wish to donate able resources as well as receive timely updates from all partici pating community agencies. The Tampa JCCs and Federation web portal is Jewishtampa.recovers. org. The Pinellas and Pasco Federation uses jewishpinellaspasco. recovers.org. In an email to the community, Socash said she decided to set up this communitywide disaster resource after Charlottesville, envisioning using it should the area ever face a similar hate-based rally. Then after seeing the devculty in communication, she said. I could imagine how it could be doubly helpful in the unlikely event we faced such a situation, she said. Today we face this situation.